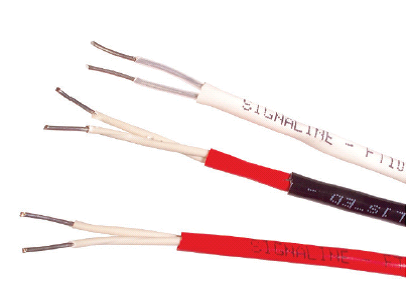 Signaline Fixed Temperature Detection Cables for Fire & Safety Applications. – Fixed temperature heat detection cables for fire protection. – 3 temperature points + extra high setting. – Conductor Resistance: 0.190 ohms/m @ 20 degrees Celsius. – Max. Voltage: 42VDC or 30VAC. – Dieletric Withstand (UL): 500VDC. – Tensile Strength: 1700N/mm squared. – Min. Bend Radius: 75mm. – Weight: 1.2kg per 100m. LGMFT68 68 degrees Celsius alarm, 45 degrees Celsius max ambient temp, red PVC outer sheathe, 3.5mm diameter. LGMFT68R 68 degrees Celsius alarm, 45 degrees Celsius max ambient temp, black chemical and UV resistant nylon outer sheathe, 4.5mm diameter. LGMFT88 88 degrees Celsius alarm, 70 degrees Celsius max ambient temp, white PVC outer sheathe, 3.5mm diameter. LGMFT105 105 degrees Celsius alarm, 85 degrees Celsius max ambient temp, white PVC outer sheathe, 3.5mm diameter. LGMFT105R 105 degrees Celsius alarm, 85 degrees Celsius max ambient temp, black chemical and UV resistant nylon outer sheathe, 4.5mm diameter. LGMFT185R 185 degrees Celsius alarm, 125 degrees Celsius max ambient temp, red chemical and UV resistant nylon outer sheathe, 3.6mm diameter. LGMUCBEX Ex e Universal connection (suitable for use as end of line, interposing line unit or junction box; 2GD Ex e IIC T5 Ta -40 to +55 degrees Celsius, @GD Ex tb IIIC T95 degrees Celsius – IECEx approval IECExSIR06.0106), 70 x 80 x55mm, 0.4kg. 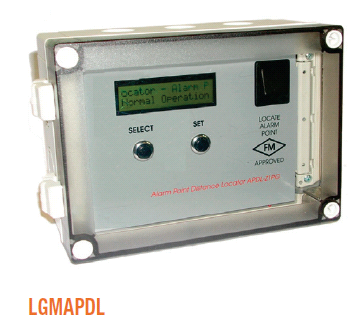 LGMAPDL Alarm point distance locator, 180 x 130 x 78mm, 1.2kg.